As the business owner, the job of business development for your creative agency has been yours—from the beginning. But the thing is, you don’t like it. Maybe you don’t feel good at it, or successful as a salesperson, or maybe it just feels icky. But none of that matters now, because there’s a solution. You’re going to hire a salesperson, and that’s going to fix everything. It makes perfect sense. A skilled and experienced salesperson would (likely) know exactly what to do in order to increase sales. A skilled and experienced salesperson would handle the clients better, write better proposals, and close more of them…You’re asking yourself “Why didn’t I do this sooner?” before you even have your first candidate for the job. I don’t mean to rain on your parade, truly. But before we get too far down this path, there’s a couple of things we should consider. First, how are we going to attract that winning, experienced sales person? Great salespeople want to make sales. They want to know that they can drop into a position that has leads and is built on a lead generation system that works. They want to know that the product is a great fit for clients and that we have a long track record of happy clients… If you haven’t been successful at selling your agency’s services, that’s likely a red flag for them! You see, if someone is a successful salesperson, they have that track record of success in their current situation; why would they leave that for your business—where you don’t have a track record of sales success? What are you offering that is better than the role they have now? Don’t get me started on the idea of paying commission only! Who’s going to leave a successful situation for that? If you do find someone willing to take a commission only role, you most likely don’t want them! Oh, and one other thing: no hired sales person will out-sell the owner. Several years ago I worked with a national company that sold a product through installation dealers. We provided a CRM system to the dealers so that we could distribute leads to them! At the end of every year we pulled together all the data from all the dealers (over 200 locations). Year after year we saw that even the worst owner outsold the best sales person—by a LOT. When you think about it, it’s no surprise. As the owner, you have more credibility than any sales person. If you say it will get done, people believe you. You have flexibility that no sales person has: you can change terms, pricing, even the service offering—after all, you are the boss! This is twice as true in an agency! When you—the agency owner—are selling services, a part of the service offering is you. When you send a salesperson who has never done the work, how can they speak with the expertise and knowledge that you have? They can’t. I hate to break it to you, but you are the best salesperson that your business has. You need a button to push when you need more leads. What generates leads is different in every business; but if you can’t create leads, then you don’t have control of your business. Yes, word-of-mouth, referral leads are the best; they close at the highest rate, they are more likely to pay your full fee, they are great! There’s only one problem with word-of-mouth: you can’t turn them on when you need them. If you want to grow, you need a lead machine. For some businesses it’s webinars, for others it’s networking, for others it’s writing and speaking. Whatever it is, you need to do it consistently—and measure results—until you know that you can make leads when you need them. The only way you can control your sales is to control the leads you get. You’re busy. You’re working hard; so I don’t want to waste your time on leads that don’t close. Even the best lead machines don’t attract ONLY “people who need what you offer”. Some folks are going to be tire-kickers, some aren’t going to be able to afford it, some don’t know what they want. It’s your job to quickly determine what they need, and whether or not you are the right solution for their problem. If you are regularly generating leads, and qualifying HARD, and you are still having a hard time keeping up, then you are ready for some help. That help won’t come from the ace sales person you’ve been dreaming of; it could come from a junior sales assistant. Someone who’s young, energetic, and willing to learn, can lighten your load. Let them do some follow-up, write first drafts of proposals, and eventually take care of the initial screening phone calls. Your sales assistant’s job is to keep you focused on face-to-face meetings where you can represent your firm, diagnose the prospect’s issues, and win the business. So the good news is you don’t need to go through all the trouble of a recruiting process. 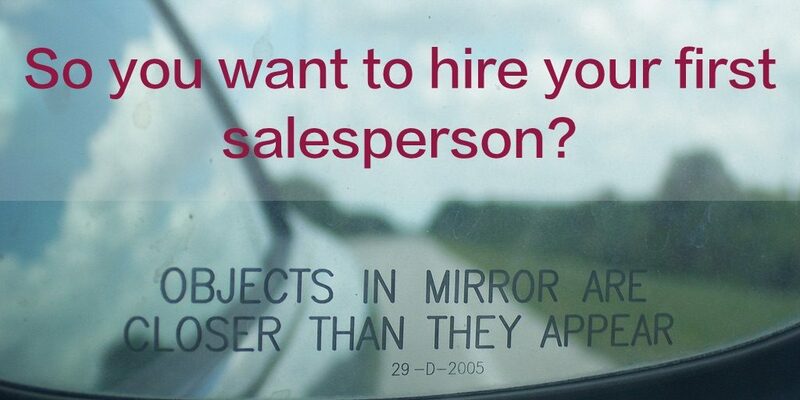 Your crack salesperson already works for you. It’s you!